My wife Paige and daughter Margot visiting Lemonly HQ last February for our Super Bowl Party. Let me start by saying this, I want to do more. What am I talking about? 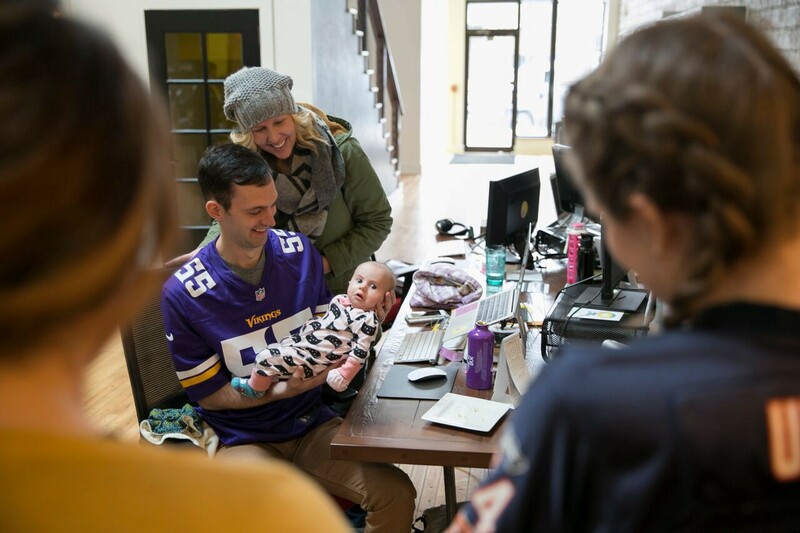 Parental leave and how we handle this benefit at Lemonly. Lemonly has 18 full-time employees. This year we have four mothers going on maternity leave. Two have had a baby in the last couple months and the other two will before the end of the year. That’s nearly 25% of our team. In 2015, Lemonly had three fathers (including myself) have children and all three also took time for paternity leave. TL;DR Lemonly is having tons of babies! Parental leave becomes a huge challenge for Lemonly and, I’m sure, for many small businesses like ours. As many of you know, the U.S. is one of only three countries in the world that does not guarantee paid parental leave to its workforce. Many companies in our home state of South Dakota offer no paid parental leave. It seems if your company offers one or two weeks paid than you are one of the lucky few. Lemonly offers four weeks of paid leave for new moms and two weeks of paid leave for new dads. We also have three of our current mothers that work four-day weeks to allow them to have more time at home, and any employee (mother, father, or non-parents) have the ability to work from home to provide extra flexibility. I’m proud of this, but you know what? We could pride ourselves on our policy, considering only 12 percent of U.S. private sector workers can take paid family leave through their employer, but honestly, there are still others out there doing more. In a perfect world, every employer could adopt the Netflix policy — a full year of unlimited paid leave following a birth or adoption for any salaried employee, male or female. Employees can take the full year, take a few months and come back part-time, come back full-time and go back out again, whatever fits their needs. Now make no mistake, I understand this is a “perfect world” scenario and doesn’t work for many businesses, including Lemonly. But the perfect world scenario does give us inspiration to create a better world. Not all benefits for new moms and dads have to involve paid leave, or even spending money at all. Maybe you can allow parents to come back part-time, work different hours, office remotely for a few weeks, or simply be flexible when Johnny gets sick at daycare or Suzy has her six-month-checkup. I’ve been a dad for eight months, so I know how much a baby changes a person’s life. It’s absolutely critical for new parents to have the time they need to be just that — new parents. On the other hand, I’ve been a CEO for seven years, so I also know how parental leave affects the workload and operations of a small business. That said, Lemonly couldn’t have the caliber of employees or the level of success we’ve gained without our parental leave policy. We all want employees and coworkers who look forward to coming to work. I’d rather do what we have to do to cover a new parent’s workload while they’re gone than have that mom or dad in the office, upset, wanting to be with their new addition. Even worse, what if that employee chooses to leave the company rather than come back to work before he or she is ready? Providing parental leave benefits is an opportunity for both the employee and company to win. An employee is going through such an important time in their personal life and needs to feel supported and valued. Companies have the opportunity to build trust and loyalty from their staff. It’s not just an investment in your employee, but it is an investment in the future of the company. If businesses can take care of their employees when it matters most (e.g., the birth of a child), they’ll earn it back in spades. For more thoughts on company culture and how to do work you believe in, subscribe to my newsletter — Point Letter.